Upon his arrival in the city of Antioch, the blessed John was received with joy by the Most Holy Patriarch Meletius, who gave him a place to live. A short time thereafter, the Patriarch ordained John to the diaconate. He remained a deacon for five years and became the adornment of the Church, both because of the virtue of his life and on account of the edifying treatises which he wrote at that time. While John was a deacon, Saint Meletius went to Constantinople for the occasion of the appointment of Saint Gregory Nazianzus as Patriarch. There he reposed in the Lord. When John heard of the death of Patriarch Meletius, he left Antioch and returned to the Monastery where he lived earlier. The monks were very glad that John had come back, and his return occasioned a spiritual celebration. The blessed one instructed them as before, and remained there for three years, leading a quiet, God-pleasing life. One night, while Flavian occupied the throne of Antioch, an Angel of the Lord appeared to the Patriarch as he stood at prayer. The Angel said, "Go tomorrow to the Monastery where John, the favorite of God, has his dwelling, bring him back to the city and ordain him Presbyter (Priest), for he is a chosen vessel and God will turn a multitude of people unto Himself through him." An Angel also appeared to John at the same time. The Saint was praying in his cell during the night, according to his custom when the Angel came to him and commanded him to return with Flavian to the city and to accept the Priesthood. The next day, the Patriarch arrived at the Monastery, and the blessed John and all the monks came forth to meet him. They bowed down before him, received his blessing, and then led him to the church with fitting honor. The Patriarch served the Holy Liturgy, communed all the brethren with the Divine Mysteries (Sacraments), and after blessing the brethren again, returned to the city with John. The monks wept inconsolably, because they did not wish that John be taken from them. The next day John was ordained. When the Patriarch placed his hand upon John's head, a shining white dove suddenly appeared, flying above the Saint. Seeing this, the Patriarch Flavian and all those present were amazed and stood there marveling. Word of this miracle spread throughout Antioch, the neighboring cities, and all Syria, and those who heard of it said, "What shall this man become? The glory of the Lord had overshadowed him from the very day of his ordination!" Once he was made a Presbyter (Priest), Saint John began to care for the salvation of men's souls with still greater zeal. The blessed one often preached without a written text to the faithful in church, causing the people of Antioch to marvel greatly and praise him. Many times the blessed one (especially during his first years as a Priest) gave sermons rich in wisdom and learning, which could not readily be understood by certain of his hearers, who were person of little education. Once, one such woman, who was listening to the Saint speak but could not understand the meaning of what he said, cried out to him, "O spiritual teacher! I would do well to call you John of the golden mouth (Chryso-stomos). The well of your teaching, is deep, however, the rope of our minds is short and cannot reach its depths!" Then many of the people began to say, "God Himself has given you this name through this woman!" 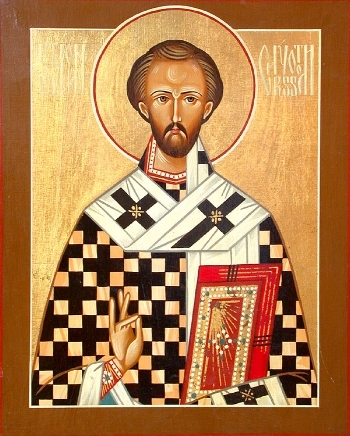 And from that time until the present the whole Church has called Saint John by the name "Chrysostom," which means "golden-mouthed." In time, the holy Chrysostom came to understand that it was not profitable to address the people in a manner they could not comprehend, so he ceased employing the refinements of rhetoric. Instead, he preached simple homilies which taught moral lessons, so that even the simplest of his hearers might fully understand and benefit from his sermons. Some time later, Nekatarios, successor of Saint Gregory Nazianzus as Patriarch of Constantinople, reposed in peace. A long search ensued for a man worthy of the Patriarch throne. Eventually the Emperor Arcadius learned of Saint John, because the fame of his eloquence and holy life had spread everywhere. All the people of Constantinople wished to have him as a successor to Nektarios, so the Emperor without delay sent an edict to Flavian, ordering him to send John to the Imperial City. When the people of Antioch learned of this, they assembled in the Cathedral and prepared to oppose the imperial emissaries, for they refused to be deprived of their beloved teacher. They would not even heed the exhortations of their Patriarch concerning the matter. John himself did not wish to go to Constantinople, since he was humble and considered himself unworthy of the lofty rank of Patriarch. The Emperor learned of these things, which caused him to desire to see John and to have him as Patriarch still more. Therefore, he sent the Count Asterius to take John from the people secretly and to bring him to Constantinople. The Count succeeded in his mission, and when Saint John drew near the Imperial City, all its inhabitants went out to meet him. The Emperor sent a multitude of nobles to greet the Saint, and then himself received him with great honor in the presence of the Clergy and the people. All rejoiced at the coming of this great luminary of the Church except for Patriarch Theophilos of Alexandria and those who thought as he did. Theophilos was greatly troubled, because he envied Saint John's fame and hated the Saint. He wished to see one of his own presbyters, whose name was Isidore, made Patriarch, and did not accept the decision of the council which elected Saint John to the throne. Nevertheless, Theophilos was compelled to submit to the Council's resolution and to consecrate John. (i.e., a Bishop is consecrated). The blessed one was elevated to the Patriarchal throne in the year 398 A.D., on the 26th day of February. The Emperor and all his princes and nobles went to receive the blessing of the newly consecrated Patriarch, who prayed for the ruler and the people, blessing them all. The Saint then gave a most edifying homily, exhorting the Emperor to adhere to the Orthodox Christian faith, to shun heretics, to attend the services of the Church frequently, and to govern in a righteous and compassionate manner. "May Your Piety know," said he, "that I shall not fail to reprove and correct you when necessary, even as the Prophet Nathan did not hesitate to upbraid King David for his transgression."